Starting new businesses is the key to growing any economy. But starting businesses can get expensive, and unless you are a trendy new startup, getting funding can be difficult. While many people may be dreaming of launching a new startup in Silicon Valley or the Big Apple, those places also come with the largest upfront costs. 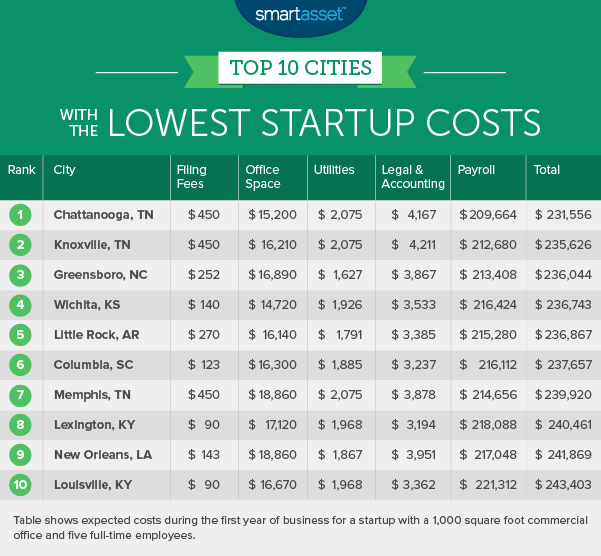 Below we look at data to find the cities with the lowest startup costs. In order to find the cities with the lowest startup costs, SmartAsset gathered data on 80 cities. We compared them across metrics like the cost of labor, office space, energy, legal and accounting fees, utilities and filing fees. This is our third annual look at startup costs. Read the 2016 version here. 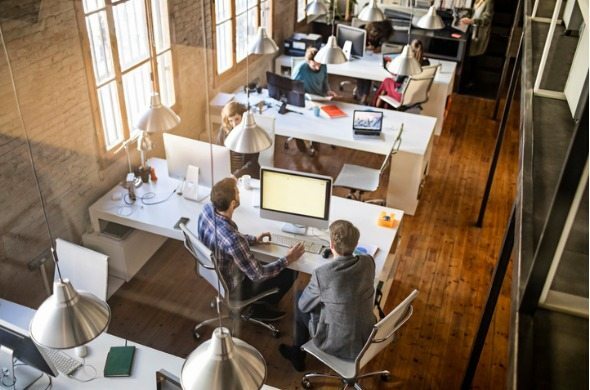 More of the same – Many of the cities with the lowest startup costs in 2016 kept their spots in the top 10 for 2017. Only Orlando, Florida and Winston-Salem, North Carolina lost their spots. They were replaced by New Orleans, Louisiana and Louisville, Kentucky. Appalachia dominates – The states around the southern portion of the Appalachian mountain range occupied most of this top 10. In particular states like Tennessee and Kentucky scored very well. This was largely thanks to the low cost of hiring workers. Expensive startup hubs – The most expensive places to get startups up and running are the places you probably tend to associate with startups. Cities like San Jose, San Francisco and Oakland in California and New York City are all in the top 10 cities with the highest startup costs. For the third year in a row, no city on our list was more affordable for running a startup than Chattanooga. What makes Chattanooga so affordable is the cost of hiring workers. We estimate that median labor costs for five people would run up a bill of about $210,000. That is the lowest in our study and about $44,000 less than the study average. Chattanooga is also home to the University of Tennessee at Chattanooga, so finding recent graduates who are talented, ambitious and ready to be hired by your startup should not be too difficult. Tennessee sweeps the top two spots. Knoxville is a bit more expensive than Chattanooga. We estimate that running a five-person startup will cost about $235,600, on average, in Knoxville. Renting a 1,000-square-foot office in Knoxville is about $1,000 more expensive than in Chattanooga, on average. Payroll, according to Bureau of Labor Statistics data, would cost about $4,000 more. If you settle on Knoxville and end up needing some professional financial advice, these are the top Knoxville financial advisor firms. Located about 300 miles east of Knoxville is third-ranked Greensboro. Running a startup here will cost a total of about $236,000, $400 more than Knoxville. Utilities in Greensboro are slightly more affordable than they are in the two cities ranked above it, costing an estimated $1,600 per year. Labor costs on the other hand are affordable by national standards but not low enough to rank Greensboro any higher. One concern for business owners here compared, to those in Tennessee, is that North Carolina has a state income tax of 5.75%. Wichita dropped two spots from last year’s study. Overall, we estimate the costs setting up a startup with a team of five in Wichita is about $4,000 more expensive that it was last year. That increase is due to the cost of labor going up. We estimate that the annual median cost of paying for five full-time employees would cost about $216,000 per year up from $212,000 last year. Arkansas’ capital takes fifth. That is one position higher than last year. According to our data, payroll here would actually cost less than it would in Wichita. Higher property prices are what pushes Little Rock down on this ranking. We estimate that 1,000 square feet of office space would cost $16,000 per year in Little Rock, on average. Another benefit to starting a company in Little Rock is the quality of local labor. This city is home to both the University of Arkansas at Little Rock and the University of Arkansas for Medical Sciences. If your business could use some assistance with its finances, take a look at our top financial advisor firms in Little Rock. The second-largest city in South Carolina is also the city with the sixth-lowest startup costs. If you’re thinking about setting up shop here and hiring help, expect to pay about $43,200 for the median full-time employee. That means in our model, where a startup was run with five employees, annual payroll would cost about $216,000. Overall the cost of setting up and running a startup in Columbia should cost around $237,600, on average. Memphis is the third and final Tennessee city to crack this top 10. Filing fees here are about $450, the largest in the top 10, but not a lot in the grand scheme of things. Legal and accounting fees, for example, should cost about $3,900, on average. And we estimate that the median payroll for five full-time employees would cost about $214,600. One benefit to running a business in Memphis is that it is a fairly large city. That means plenty of potential customers and employees. Memphis has about 653,000 residents. The southeastern portion of the United States continues its dominance on this list. Up next is Lexington, coming in a mere $500 more expensive than Memphis. Lexington has the second-highest estimated payroll in our top 10. Business owners will save a bit on legal and accounting fees, however. We estimate that legal and accounting fees will cost only $3,200, on average. Lexington business owners are also blessed with the lowest filing fees in our study. Although at $90, the filing fees will hardly make or break a business. New Orleans is a transportation hub, utilizing the Mississippi River to transport goods across the country. That means any new businesses which cater to that industry would be well placed here. Along with transportation, New Orleans is a great tourist destination as well. Potential new startups may look to capitalize on that. Overall, we estimate that the cost of setting up and running a startup with five full-time employees with 1,000 square feet of office space would cost about $241,800 in the Big Easy. Kentucky’s largest city takes the final spot on this list. Google recently announced Google Fiber was coming to Louisville. This means any companies which need to take advantage of high speed internet would do well in Louisville. Overall getting a startup up and running in Louisville would cost about $243,400, on average. The bulk of that figure would be dedicated to payroll. We estimate running a five-person team in Louisville would cost about $221,000. 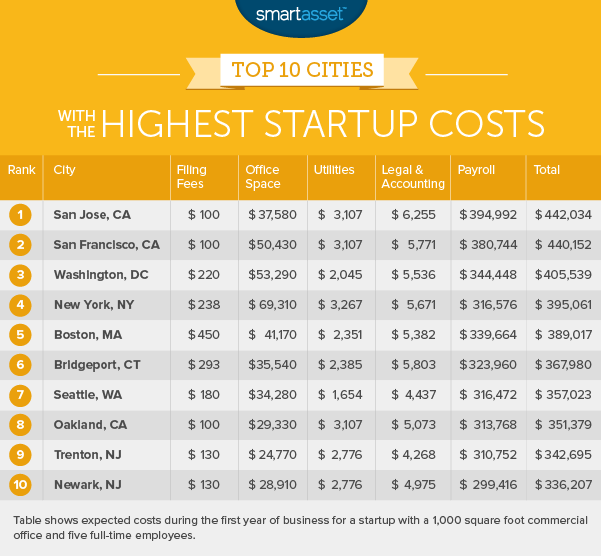 We also researched the cities with the highest startup costs. The top 10 is the same as last year, though total costs are slightly higher this year. Almost all of the increase in cost has come from an increase in payroll costs. San Francisco in particular saw costs increase by almost $17,000. Of course paying high salaries in places like San Jose or New York comes with the territory. If you have a startup requiring advanced STEM skills and want to have large pools of potential workers to hire from, you may need to go to cities like San Jose. Filings fees. This is the average cost of licensing fees for LLCs and corporations. Data comes from bizfilings.com. Office space. This is the average cost of leasing a 1,000-square foot office. Data comes REIS Inc.
Utilities. This is the expected cost of electricity and gas for a 1,000-square-foot office according to local rates. Data comes from the Energy Information Administration. Legal and accounting fees. On a national level, we estimated startups spend $1,000 in accounting fees and $3,500 in legal fees in their first year. We estimated the number of hours of work these sums would equal for the average accountant and lawyer on a national level. We then arrived at our local costs by multiplying those hours worked by average local hourly pay for accountants and lawyers based on 2016 Bureau of Labor Statistics data. Payroll. This is the cost of hiring five full-time employees at the median annual salary. Data comes from the Bureau of Labor Statistics. To rank the cities, we added up all these costs. The city with the lowest overall costs ranked first and the city with the highest overall cost ranked last. Unfortunately, paying business taxes is more complicated than paying regular income taxes. How much you have to pay will depend on how your business is structured, whether it is a C corporation, S corporation or LLC. Each comes with its own advantages and disadvantages. Make sure you read up on which is right for your business. If you are running a small business there are lots of potential tax credits you should be aware of. For example, the Small Business Health Care Tax Credit is available to business owners who pay for the health care of their employees. Tax credits are also available for starting greener businesses as well. Regardless, make sure you have good records of everything you do. This can make filing your taxes easier and when you talk to an accountant they may be able to help you find tax credits you never even considered.